Inspired by Josh Bloch's Java Puzzlers, we put together our own Python Puzzlers. 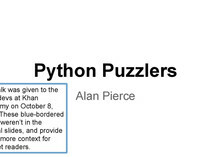 This slide deck brings you a set of 10 python puzzlers, that are fun and educational. Each puzzler will show you a piece of python code. Your task if to figure out what happens when the code is run. Whether you're a python beginner or a passionate python veteran, we hope that there's something to learn for everybody. This slide deck was first presented at shopkick. Nandan Sawant and Ryan Rueth are engineers at shopkick. Keeping the audience in mind, most of the puzzlers are based on python 2.x.